Philsen Library, University Of Auckland, Medical and Health Sciences Building. Commissioned to commemorate Sir Douglas Robb. The Artwork was conceived to reference the Hippocratic Oath. 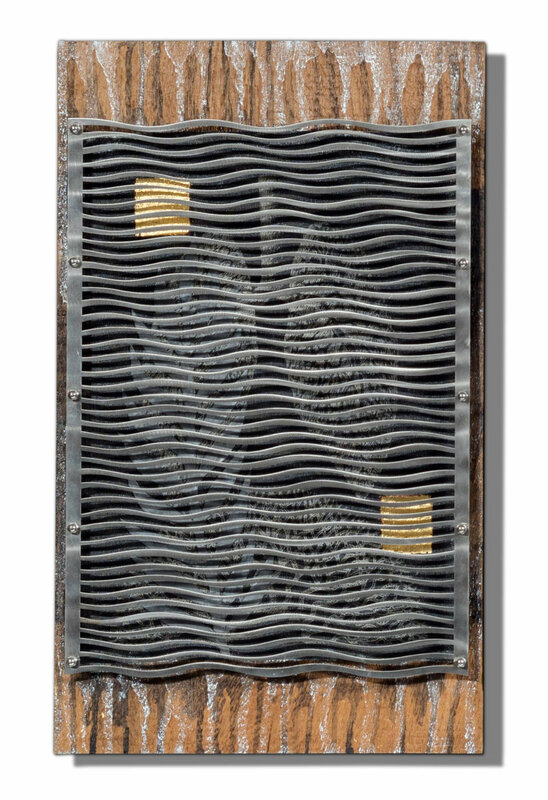 Presented in a linear format the ‘concertina‘ folding Artist’s bookwork, portrays a series of spaces to reference the River of Time, and the flow of history and progress. 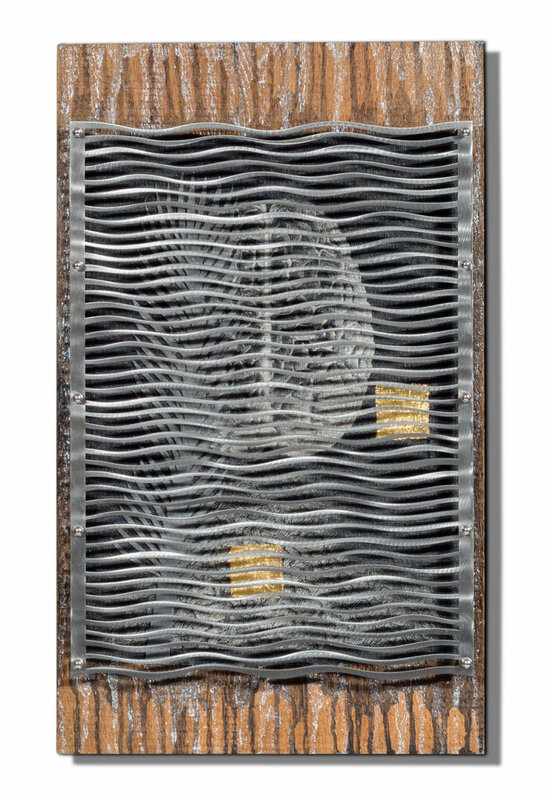 By overlaying the Artwork, are seven metal panels that create a wave-screen. I hoped to entice viewers to look through the screen to the imagery on the panels of the Artwork. ‘To gaze at the river made of time and water and recall that time itself is another river’ Jorge Luis Borges. The Artwork was conceived to transcend technique and early medical knowledge and to be both strong and fragile. I wanted layers of history and imagery to suggest mystery and intrigue, as if threatening to return to darkness and disappear. The imagery combines transcripts of the Hippocratic Oath in both English and Maori. Superimposed over each Oath, is a ‘scissor-cut’ outline of my hand in beaten sheet lead. The raised hand is one of mankind’s fundamental images, an ancient image of humanity and of indigenous people, the image extends back to cave images. The hand was also a symbol in Chinese Acupuncture and Persian medicine. It is a signal of ‘stop and listen’ and symbol of peace, surrender and hope. 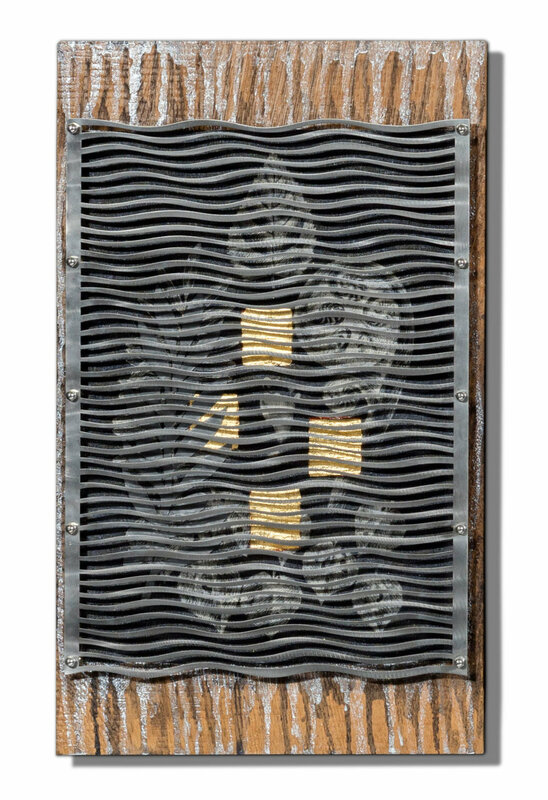 The black and white imagery applied directly onto the wood panels, includes the Brain (life), Lungs (breath), and Skull (death), The only colour glimpses are of red pigment beneath the gold leaf. Iconography of embossed and beaten lead is fixed over the hand drawn images of plants used in Maori herbal medicine; Makomako, Mamaku and Kawakawa combined with Olive and Grape vine leaves of Western traditional healing. Dimensions: Height 550mm x Width 2100mm x Depth 55mm. 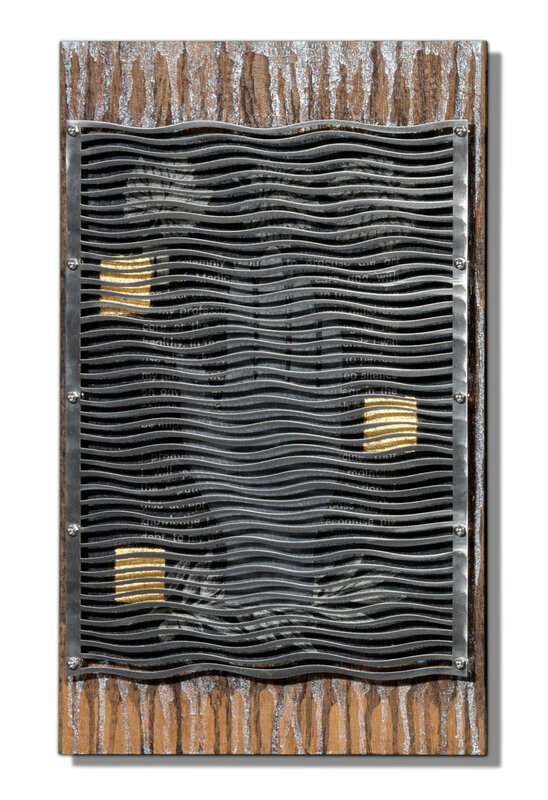 Materials: Salvaged Oak, beaten and embossed Lead, Gold Leaf, Stainless Steel, Acrylic pigment and original drawings printed on linen.